Since President Trump threw down the gauntlet to Democratic Party leaders Rep. Nancy Pelosi and Sen. Charles Schumer, all we’ve heard from the Republican Party’s Capitol Hill leadership is a deafening silence. 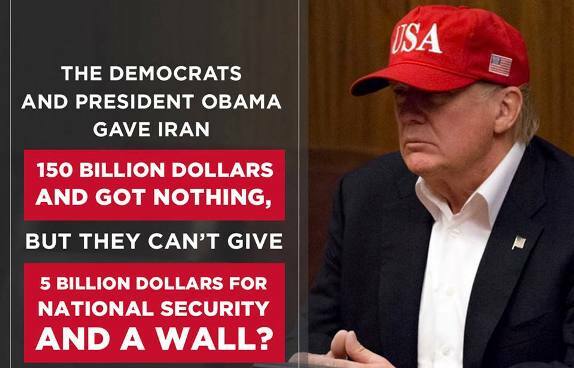 However, grassroots conservatives are not waiting around for the Republican establishment to finally figure out Trump is right about the necessity of building a wall on our southern border. CHQ has launched our “Don’t Waste The Lame Duck, Build The Wall” campaign aimed at giving spine transplants to squishy Republican legislators, especially in the House where some 40 Republicans are retiring or were defeated in the November midterm election. Our friends at Americans for Limited Government have also launched http://buildwallnow.org/ and reminded us that after the 2016 election, Congressional Republicans gathered in Philadelphia to map out their agenda, where it was announced by then-incoming House Speaker Paul Ryan (R-Wis.) and Senate Majority Leader Mitch McConnell (R-Ky.) that Congress with Republican majorities would fund the southern border wall at $12 billion to $15 billion, calling it one of the most important promises the President had made in the campaign. However, says ALG, since 2016 Speaker Ryan and Senate Majority Leader McConnell have moved the goal posts at least four times, always putting off the fight and the vote to some undefined time in the future. Repeal the Flores Settlement agreement that only allows the feds to detain minors who cross the border illegally for 20 days. Saying we need to end asylum fraud and the catch and release of illegal border crossers by passing the Meadows - Jordan amendments our friends at NumbersUSA have added the amendament to their action board to rally their millions of supporters behind it. You may reach the NumbersUSA action board through the link. Submitted by simonjester on Sun, 12/16/2018 - 14:18. What is wrong with you people!?! Do you WANT to be replaced in your own country? Get the freaking wall built already!!! Submitted by xsnake on Thu, 12/13/2018 - 16:36. A lot more cost effective.....and I'll bet more effective....to bribe....errrr....invest into the Mexican government, for the purpose of THEM keeping people from crossing into America. Submitted by email_registrat... on Fri, 12/14/2018 - 11:45. You think? You might have to live in Mexico, as I have, to see just what a mafia is really running the country. There is so much money from drug and human trafficking that no amount of bribe, or "mordida" will stop it. It is like vector control measures. We never get rid of all the rats but with constant warfare we can minimize their damage. Submitted by email_registrat... on Thu, 12/13/2018 - 15:24. I don't think a wall will do it. Let the military use machine guns. In Texas the Minute Men have things pretty well in hand. I'm in a paramilitary outfit and no Vera, although veterans we aren't old men gumming our oatmeal. NOBODY IS ENTERING THE REPUBLIC ILLEGALLY AND ALIVE!